For generations, the BMW 5-Series has led its class thanks to its innovation, style, and performance. This iconic sedan has returned with a new look and new attitude to take on its competition in a big way. New Motors BMW has a selection of 5-Series models available for all of our Erie, Meadville, Edinboro, Waterford, PA, and Conneaut, OH area customers. We take pride in being one of the area's leading BMW dealers and will work to pair you with the 5-Series you want today. Taking on sedans like the Mercedes-Benz E-Class and Audi A6, the new BMW 5-Series continues to set the bar for its competition. Let us take a closer look at how the 5-Series stacks up against its rivals. While the BMW 5-Series and Mercedes-Benz E-Class are both great luxury sedan options, the 5-Series takes the lead in several notable ways. The 5-Series comes in at a lower MSRP than the E-Class, offering drivers impressive performance at a more affordable price. Drivers will also get greater fuel efficiency with the 5-Series averaging 34 miles per gallon highway compared to the E-Class averaging 30 miles per gallon highway. Both vehicles offer impressive agility and come with rear-wheel drive for more sporty performance on the road. Next, let's look at how the 5-Series stacks up against the new Audi A6. 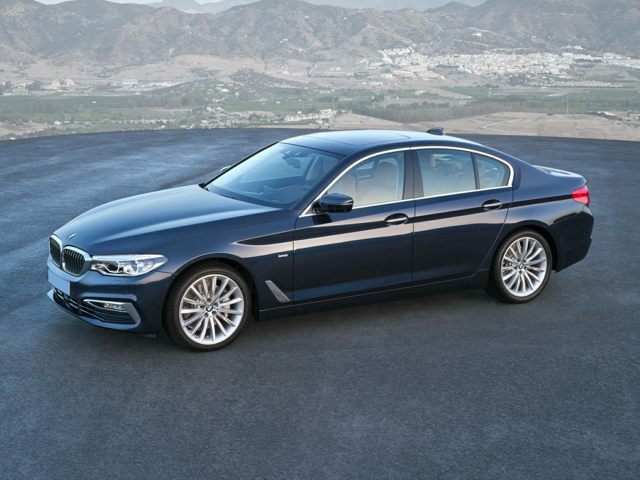 As mentioned above, the new 5-Series comes with standard real-wheel drive compared to the A6's front-wheel drive. Both vehicles come with four-cylinder turbo engines for exhilarating performance. The 5-Series comes with more standard innovations than the A6 with features such as a 16-way adjustable driver's seat, a universal garage door opener, and much more. For more information on how the new BMW 5-Series compares to the Mercedes-Benz E-Class and Audi A6, make your way to New Motors BMW. Our sales associates are here for you, and we will work to get you on the road in the new 5-Series you want today. Be sure to stop by our finance department as well and get approved quickly and easily.